Concussions in Soccer: Does Protective Headgear Reduce Risk? Jeff Skeen of Full90 Sports explains how daughter's concussion led to start of soccer headgear company. Concussions in Soccer: More Common Than Parents Realize? 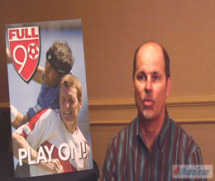 Jeff Skeen of Full90 says concussions in soccer are lot more common than parents realize.